Enjoy a better night's sleep with a new mattress tonight! Browse through our available mattress options: Twin to king size, one or two sided, inner-spring or memory foam, and select the one that's right for you. Our mattresses and bunky boards, are always available in stock! Find everything you need for your bunk bed or day bed, too! 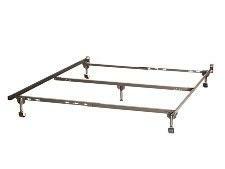 - Mattresses, bunky boards, pop-out trundles and link springs are always in-stock. Complete your new mattress investment, with a metal adjustable bed frame base or bed frame and experience a better rest. STAINS, TORNS, BURNS OR ABUSE OF THE MATTRESS / FOUNDATION, WILL VOID THE WARRANTY. A new mattress is an investment, not an expense. It's an investment that enhances your quality of life and everything you do. An uncomfortable bed disrupts your sleep. it also affects your work performance which can lead to decreased productivity, poor judgement, attitude and health problems. The Warranty is there to protect you against product defects, not against the gradual loss of comfort. Although a mattress set may be usable after 10 years, it may no longer be providing the comfort and support your body needs. A common mistake in purchasing a bed is buying one that is too small. Before you start shopping, ask yourself if you are satisfied with the amount of sleep space in your current bed. If you sleep with someone else, don't settle for anything less than a queen size. Consider a king size if you're tall or like having the extra space. Since king mattresses are much longer and wider, the foundation is split in two pieces, making it easier to navigate around stairs and tight corners. Don't make the mistake of putting a new mattress on an old foundation. 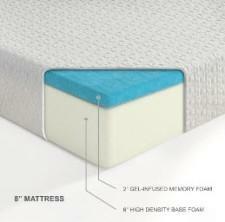 A new mattress and foundation are engineered to work together as a sleep tool. The foundation / box spring, acts like a shock absorber, taking a lot of the nightly wear and tear, and performance to the sets overall comfort and support. Also, when you buy the set ( both items at the same time ), you will be acquiring the full warranty from the manufacturer. 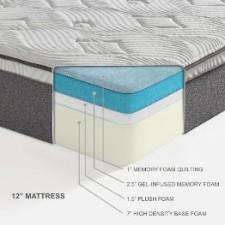 Memory foam offers multiple benefits over traditional mattresses. The major benefit is the cellular structure that memory foam consists of. While typical coils are spaced throughout a bed, memory foam cradles your body at every point so you feel supported and relaxed. * Better Pressure Relief & Support: With its continuous, full bodied design, memory foam envelops your body and provides unmatched pressure relief and pushes against your body to support it. * Faster Relief for Aches and Pains: By conforming to your body at your pressure points, memory foam can alleviate stress and pain you collect during the day. * No Motion Transfer: With its advanced cell structure, memory foam subtly absorbs your motion so you can easily get in and out of bed without disturbing your partner. After getting a new memory foam mattress, it takes time for your body to become accustomed to the proper support and pressure relief that it provides. This adjustment period varies anywhere from two to four weeks. All memory foam mattresses are neatly packaged in a small box. Memory foam mattresses are carefully wrapped in protective plastic, then machine compressed to make them as compact as possible. Once they are flattened, they are rolled for efficient shipping to you. * Slide the wrapped package out of the box, leaving the mattress inside of the plastic cover. * Open plastic cover carefully, avoiding the use of sharp tools on the plastic cover to avoid damage to your new mattress. * Allow 24-48 hours for the mattress to regain full shape. It is also important to point out that you may notice a slight odor once you remove the mattress from the plastic cover. This smell is typical with new memory foam products (kind of like the New Car Smell) and is perfectly normal. Don't worry, the odor will go away within a day or so and you won’t notice it at all. For toddlers and infants, memory foam is not a great idea. However for older children and teens, memory foam is a safe and smart investment in improving your children’s sleep. Following the rotation cycles below, will ensure that your one or two sided mattress, is rotated properly. Rotate your new mattresses as part of the regular warranty of the set. Your new mattress needs to be rotated every two weeks for the first two months. After two months, rotate your mattress once a month. Additionally, your new foundation must be rotated every six months. PLEASE DO NOT ATTEMPT TO DO THE ABOVE ROTATIONS, WITHOUT HELP FROM ANOTHER PERSON.